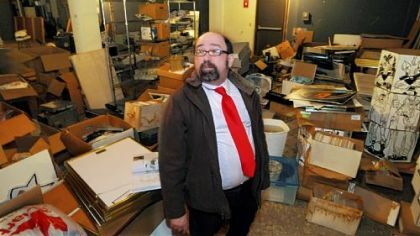 Joe Wos, executive director of the ToonSeum, Downtown, looks over comics, displays, books and other material damaged by a recent leak in the museum's North Side warehouse. 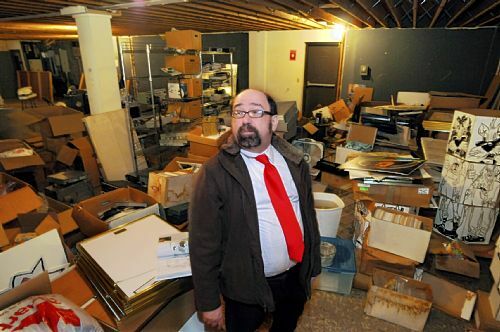 Cleanup efforts are under way this week after possibly thousands of comic books were ruined when a leaky roof sent heavy rain rushing through the ToonSeum's North Side warehouse last week, resulting in losses of up to $25,000. While no valuable comic book or original artwork was destroyed, the loss is still devastating, said Joe Wos, the museum's executive director, as he put out an appeal this week for financial help. "This is every comic book fan's worst nightmare," he said about the rains that flooded the ground-floor museum space where books and "just hundreds and hundreds and hundreds, probably thousands, of comic books" were stored. Many of the books and comic books were awaiting transfer to the museum's new on-site library on Liberty Avenue in the Cultural District. There also were comic books that would be given away at school programs or to guests at the museum. Fortunately, he said, there were no collector's items like a "Batman No. 1" among them. Nor was any original artwork stored at the site, which was not insured. Some of the books, which included such things as collections of "New Yorker" cartoons and European cartoons, can be replaced. Others will be "very difficult to replace; others will take time more than anything else. It'll just take time to find everything." The rain splashed the cardboard boxes holding the books and comic books on the way down from the ceiling and then collected an inch or two deep on the floor, soaking the cartons' bottoms. Also lost in the flooding were exhibition reproductions, which are mounted support materials used when exhibits are taken on the road, and older Macintosh computers. Mr. Wos had not yet a chance to go through a section of the warehouse where the museum stored supplies ranging from extra napkins and glasses for receptions to markers, pencils and crayons. "A lot of exhibit and workshop materials were kept over there," he said. Mr. Wos estimated cleanup of the warehouse would cost about $1,500, "and then we're going to have to find a new facility. The roof is leaking very badly; it needs to be repaired, so we're going to have to move out in the meantime." The warehouse was donated by a museum board member. He emailed "Friends of the ToonSeum" to ask for financial support. "We will pull through," he said. "We have a lot of great fans out there, so we're not worried." Donations have already started to come in. On Tuesday, Mr. Wos got a call from a Pittsburgh-based donor who said they would create a $5,000 match fund. "I love this city," Mr. Wos said. The ToonSeum was founded in 2007, moved from the Children's Museum on the North Side to its current home in 2009 and expanded into an adjacent space in November. • By sending a check to the ToonSeum, 945 Liberty Ave., Pittsburgh, PA 15222.